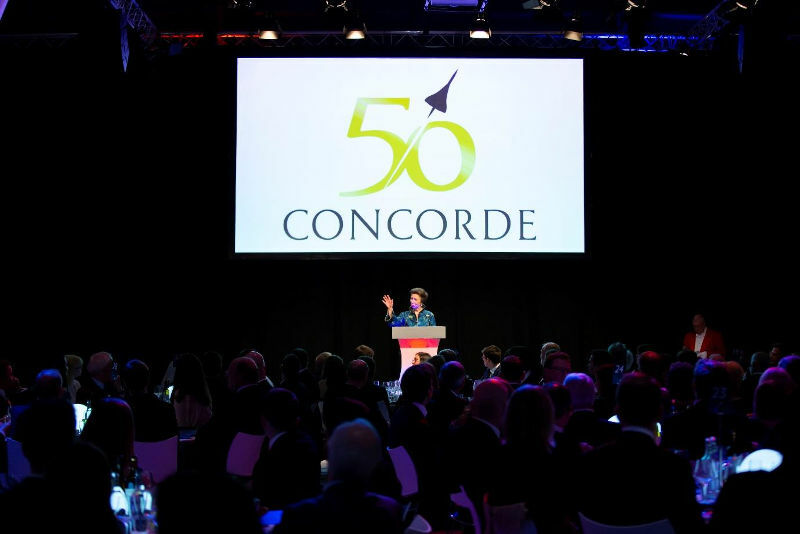 Filton, Bristol, April 9, 2019: Aerospace Bristol, a family visitor attraction that is home to the last Concorde ever to fly, has celebrated the fiftieth anniversary of Concorde’s first British flight with a dinner kindly attended by HRH The Princess Royal, Patron of the museum. Delivered in partnership with Airbus, the Concorde50 gala dinner was held under the wings of the supersonic passenger jet in Aerospace Bristol’s Concorde Hangar, on the edge of the historic Filton Airfield. It was from there that Concorde first took to the skies from British soil on 9th April 1969, and landed for the final time on 26th November 2003. Fittingly, it was the pilot of that final flight, Captain Les Brodie, who returned to the Flight Deck and – as Her Royal Highness and distinguished guests looked on – operated the controls to lower and raise Concorde’s droop nose and activate her landing lights. The manoeuvre was possible thanks to careful restoration work by Aerospace Bristol’s Conservation team and volunteers, with Concorde smoothly returning to motion as if waking for the first time since touching down more than 15 years ago. Katherine Bennett, Senior Vice President Airbus, said: “Concorde has a special place in Airbus’ heart and history. Many of its innovations, from electronic flight controls to anti-skid braking systems, helped inform future aircraft designs. We also maintained the aircraft at Filton for more than 10 years after its final flight. Aerospace Bristol will continue its Concorde anniversary celebrations with a series of Concorde50 events taking place throughout the year. The first public moves of Concorde’s droop nose will take place on Saturday 13th April 2019 at 11am and 1pm. An Aerospace Bristol ticket is required and further details can be found at www.aerospacebristol.org.